Iowa's Cedar Valley Nature Trail is a 52-mile rails-to-trails bike and hiking path that links the urban areas of Cedar Rapids to Waterloo. 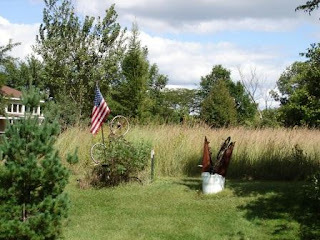 On Labor Day weekend, 2011, my wife and I decided to explore the trail by car and bike. Our exploration only extended as far north on the route as La Porte City. The southern trailhead is in Hiawatha, a suburb of Cedar Rapids. Take Interstate 380 Exit 25 (Boyson Road). We found it well-posted with signs and easy to locate from Interstate 380. 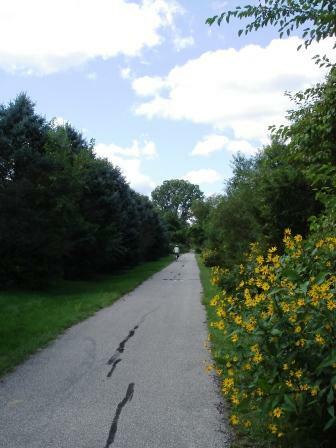 This trailhead is well-developed and well-used, obviously a popular route for bicyclists and joggers. 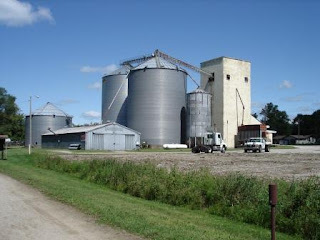 One brochure indicated that there was a campsite in Lafayette, a few miles northeast of Hiawatha and on the trail, so we returned to 380 to link with a connecting road; however, the roads overpassing the freeway did not have access to the freeway, so Lafayette is still a mystery. Center Point was our next stop, being one of the larger towns on the bike path's route. We found the town typical of many other small Iowa towns--several lawnmowers and weed-wackers busy and an otherwise quiet atmosphere. 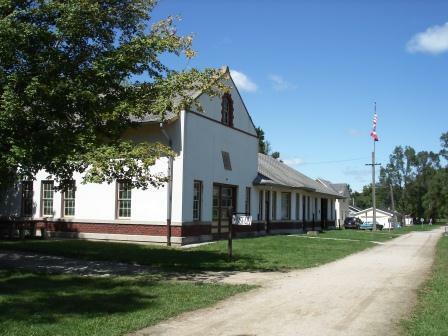 The train station museum was well-maintained and clean. The two photos above are left/right views from the trail. the CVNT runs a narrow corridor of quiet, car-free biking through the usual business of Iowa--homes and commercial farming. Having eaten a good lunch on the picnic tables provided by the Center Point train station museum, we decided to travel on to La Porte City to see McFarlane Park campgrounds and to ride the trail there. We were tired of car exploration. Take Exit 49 from 380. That is Highway D48, which will take you to La Porte City after about 10 miles of country driving. 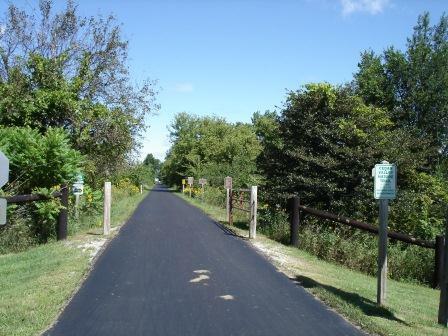 La Porte City is a well-maintained town, and riding the trail was easy because the surface was asphalt. We had a pleasant ride up and down the trail for 90 minutes, about 8-9 miles. Below are some photos of the ride. As you can see from the shot of the slough, the trail runs a narrow corridor of beauty and habitat preservation: natural scenes to one side, and highway and railroad on the other. It was also clear from the green-scummed water in low areas that there is a high amount of farm-chemical run-off. 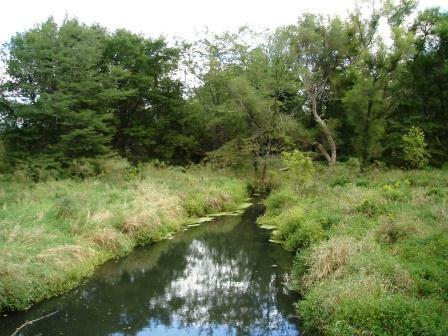 However, keeping one's eyes on the narrow tunnel of the nature trail, there was a lot of beauty to see. We finished by checking out McFarlane Park, just outside of La Porte City. 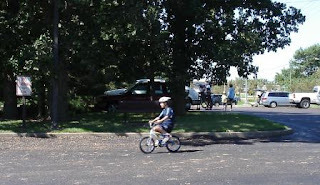 Since it was Labor Day weekend and a few days of cool weather and low humidity, the campground was packed. 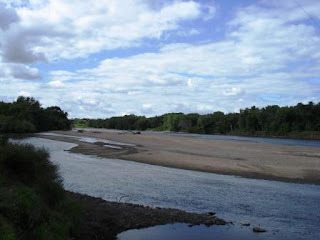 It is a beautiful space, though, and we walked to the boat ramp to see the river. 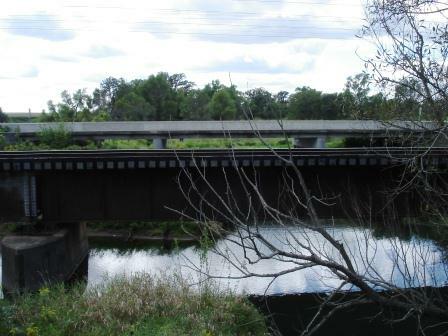 The blue line across the "triangle" of the roof peak is how high the floodwaters reached in 2008. 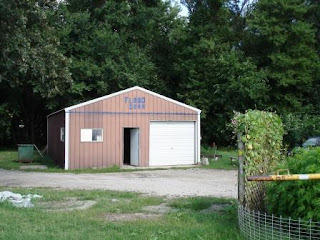 This building is part of the campground maintenance area. Brochures are available through the local county conservation board. 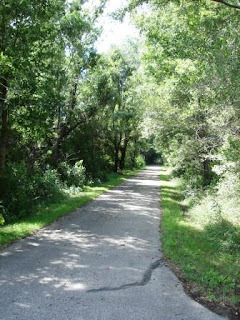 The Cedar Valley Nature Trail is well-maintained and used by many people. A bridge is out just south of McFarlane Park that will probably be replaced by the end of the construction season, 2013, as I was informed by the park commission that funding was in the future. The lure of the trail for my wife and me was to one day ride its entire length, easily enjoying ourselves and experiencing traveling for a distance and a time while living from what we pack on our bikes. 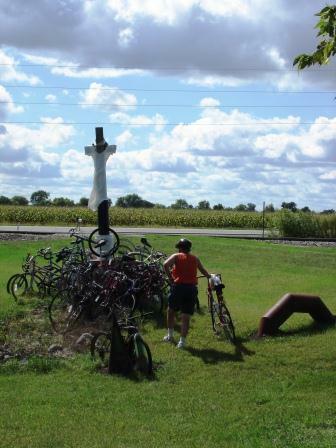 For day trips, our town of Fairfield, Iowa, has a developed network of bike trails that we can ride all day and not have to travel a couple of hours prior hitting the pedals. We prefer that. 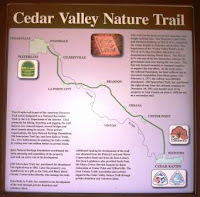 Although we enjoyed the exploring and getting away, what we really discovered is that the environment of the Cedar Valley Nature Trail is not really different from what's around where we live. Until the CVNT replaces its bridges so that the entire length of the trail can be easily explored on a multi-day trip, even though the grass is green on the trails between Cedar Rapids and Waterloo, they are no greener than beside the trails around our town a couple of hours away.